It was, then it wasn’t, then it went missing, then it’s friend went missing and now it’s definitely happening again. Nintendo Acción may be hinting that they know something we don’t know (I wonder if Sonic 4 is still doing five episodes according to them) but it’s Nintendo Power that last night seemingly finally 100% thrust the 3DS version of Sonic Generations into the “confirmed” column. Or at least 99.999999% – remember nothing is EVER confirmed until SEGA confirms it. As is uncomfortably traditional for games retailers and producers, the cover of the upcoming magazine hit early via Ninstation and subsequently The Sonic Stadium clearly shows Classic Sonic and Generations 3DS as the headline item. 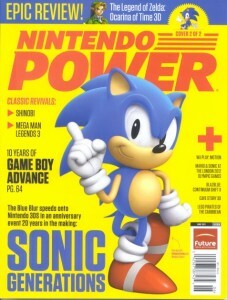 In fact, Power also seems to be doing two covers suggesting a Modern Sonic cover will also be in the works for this month. We’ll have to wait for later to see just what exactly is revealed. Finally a third game I can add to my 3DS games wishlist. So far I only want MML3DS and TOA remake.